All the body systems have their importance but in the natural health and wellness field the digestive system ranks high when it comes to priority of care because we are what we digest. This is fine, but have you ever wondered if the nutrients obtained from digestion and assimilation are getting to every 100 trillion cells of your body? Research shows that most people do not have an optimal micro-circulatory system (part of the circulatory system) and therefore are not getting the adequate oxygen and nutrients to their cells for function, repair, and multiplication. This is important to know because you can have the best digestive and absorption capability but not all is going where it should- to the cells and tissues (tissues are made up of cells). Also, if the digestive system is not receiving proper micro-circulation it will not function or heal properly- this explains the unexplained digestive issue problems. It is vital that our micro-circulatory system (made of of capillaries) operates optimally. Capillaries are the smallest of the body's blood vessels (4 to 10 microns in diameter). They are only one cell thick, and they are the sites of the transfer of oxygen and other nutrients from the bloodstream to other tissues in the body; they also collect carbon dioxide waste materials and fluids for return to the veins. From the above signs and symptoms, you can see that many people have an issue with poor micro-circulation. From 40 years of age and up, micro-circulatory problems are very frequent and are very common in elderly people. The incredible thing is that young people have been tested for micro-circulatory status and have been found deficient! Even twenty-five year old athletes! From the above list of conditions related to poor micro-circulation, it is no wonder that micro-circulation enhancement is now becoming an important topic. Micro-circulation enhancement should be a holistic approach in every wellness program or plan. Endothelial dysfunction is one of the greatest threats to the microcirculatory system. Capillaries are hollow tubes protected by endothelial lining called an endothelium. Under normal circumstances, the body utilizes the amino acid arginine to produce nitric oxide that helps relax the endothelium and allow sufficient blood flow. If the nitric oxide production is disturbed, the endothelium can collapse and restricted blood flow is the result. Heavy metals like lead and mercury result in buildup that slows down circulation. Oxidative stress and damage due to free radicals within the cell impede microcirculation. Cellular toxicity overloads cells and tissue to the point of slowing circulation. Tight clothing impairs proper peripheral circulation. A poor diet would be one that is loaded with saturated fats, junk foods, alcohol, excessive sugars and high glycemic index foods, fried foods, and heat extracted oils. What is recommended is; six vegetables a day, 2 fruits a day, one ounce of nuts like walnuts and almonds, plenty of beans like garbanzo beans and black beans, whole grains like quinoa and millet, plenty of pure water, fermented products that contain probiotics, and lastly some fish, organic chicken and grass-fed beef if you are not vegetarian. B vitamins, magnesium, vitamin C and E, K2, selenium, omega 3 fatty acids, and iron. Movement and exercise are imperative for a healthy and strong circulatory system. Normal BMI (Body Mass Index) is valuable for overall health because excess weight contributes to poor circulation. Pulsed electromagnetic fields (PEMF’s) of energy are one of the elements essential for life. These magnetic fields in the earth clearly bring planet earth to life. Without them the earth would be a lifeless rock like mars and other planets. 1. We do not spend adequate time outdoors (daily) in order to receive vital PEMFs. We should be walking barefoot on grass surfaces to be grounded with the earth’s magnetic field. 2. The earth has only 50% of the PEMFs today compared to 300 years ago. This is due to several reasons including man-made pollution. There is a special bio-electric magnetic energy regulator (B.E.M.E.R) device for therapy that has a unique patented signal that enhances circulation in an eight minute session. In fact, it is a PEMF device but in reality the PEMF is just the carrier of a patented signal that has been clinically researched in Germany for 16 years. Thousands of studies which can be seen at www.pubmed.gov prove its efficacy for enhanced micro-circulation and other positive effects. This unit can emit its signal to the whole body via a matt that is laid over a zero gravity chair or used on the ground or bed. This matt will cause micro-circulation enhancement throughout the body. It comes with accessories so that specific areas of the body like the joints or stomach area, etc., can be helped with enhanced circulation effect. Just several minutes a day three times a week for your clients or patients can change their health and life. In fact, cellular oxygen levels increase up to 30% with each session. With this, detoxification of the 100 trillion cells of your body takes place. When this happens, the cells are ready to receive the full nutrients they could not receive before because of cellular congestion due to toxins and other inhibitors. This therapy increases the electro-magnetic energy of all the cells; it improves the circulation and oxygenation of the tissues. This encourages each cell in the body to function optimally and to correct metabolic and energetic abnormalities, which result in optimal health. In order to fulfil its functions, the cell requires energy which comes from a supply of oxygen and nutrients. 50% of the energy is used to convert ADP to ATP, and the other 50% is needed to maintain the cell membrane potential. This electrical charge around the healthy cell should be 70-90mV. In disease the membrane potential is found to be reduced to 30-40mV, and in cancer even as low as 15-20mV. At levels below 60mV the membrane structure becomes distorted, and below 10mV the cell dies. This device has been shown to restore the membrane potential to normal. Astragalus is an herb found in northern Asia that’s been used to treat fatigue and sickness for thousands of years. Some of the plant constituents have shown to be so potent that they’re being used as the basis for different drugs to treat cancer, fatigue, and subdue ulcers, among other things. It’s health properties are unique that isolated compounds from its polysaccharides are being used to treat disease. Astragalus is uniquely healthy for cellular health because of its ability to protect your body’s telomeres from degradation. Telomeres are small pieces of DNA located at the edge of your chromosomes. When your cells replicate telomeres help prevent your DNA from unraveling and keep it locked into place. They serve a similar function as the plastic caps on the edges of your shoelace. The gradual shortening of telomeres is an important component of aging and different types of cancer. Astragalus causes your body to increase its production of a substance called “telomerase”, which is an enzyme that enables the production of more telomeres. In clinical studies mice treated with extracts of astragalus root had telomeres that were longer and degraded more slowly than a control group. What is impressive is that despite these remarkable effects on cellular health there’s no toxicity from astragalus. It’s been used to treat ulcers, swollen wounds, reduce hemorrhaging, and serve as a complimentary input to cancer treatments. One study on astragalus was published in the journal, Clinical Investigative Medicine, and it studied the ability of astragalus to reduce fatigue in cancer patients with very developed cases. The patients were treated with a purified extract of Astragalus membranaceous in two 1 month cycles. After the first month 82% of patients reported feeling better and more energetic, and the following month 71% of the remaining group reported better feelings of energy, vitality, and youth. The study was a double-blind placebo controlled study. Astragalus benefits diabetics. Patients who take astragalus show better blood sugar control. Astragalus Membranaceous is the kind to purchase, as it’s the kind most studied. You can either buy astragalus membranaceous in its root form or as an extract. Astragalus supplements typically come in powdered form, but it’s also available in capsules. With most supplements the amount of astragalus contained will be between 250-1000mg. It is possible that at very high dosages astragalus might suppress your immune system, and taking it with immune-stimulating drugs might cause side effects. If you have specific questions about a condition you should consult your doctor or licensed medical professional. This is not specific medical advice. Hydrilla is a green plant that grows naturally in the pristine fresh waters of Florida. It is a fascinating and remarkable plant in that it grows up to six inches a day while hyper-accumulating nutrients from the soil it is rooted in, as well as, the water it lives in. Gram per gram this super green food contains more nutrients than any plant on earth. It is the highest source of calcium and Vitamin B12. It is so nutrient dense, one need only take one 500mg capsule per 50 lbs. of body weight. Antioxidants – Hydrilla contains Vitamin E, Selenium, Zinc, Beta-Carotene/Vitamin A, and Superoxide Dismutase (SOD), a powerful, naturally occurring, essential antioxidant. Antioxidants work to protect your body from free radical damage, which results in premature aging and impaired immune system function. Essential Trace Minerals – Hydrilla is an excellent source of silica, which plays a major role in skin, nail, hair, bone, cartilage, and artery health. Hydrilla also contains cobalt, molybdenum, zinc, selenium, copper, and iron– all essential in trace amounts for proper health and an alkaline system. DNA and RNA – Hydrilla is a rich source of DNA and RNA proteins, which the body is able to use as building blocks for repair of our own strands of genetic material. Electromagnetic field (EMF) pollution has been a concern to many of us for a long time. Research indicates that constant exposure to radiation coming from cell phones, computers, radio, TV, artificial lighting, microwaves, household appliances, X ray machines, and more have a negative effect on health. Cancers and tumors have been linked to this exposure. Fatigue, muscle weakness, eye strain and poor vision, poor immunity, headaches, insomnia are just a few consequences of EMF pollution. The Quantum Pendant is a natural energy generating device which improves the metabolic and circulatory functions of the body to achieve optimal holistic health. The active ingredients inside the Pendant comprises of 76 different natural minerals extracted from volcanic rocks which are then recombined using nanotechnology and heat fusion methods. Energy medicine sees human beings as networks of complex energy fields that interface with the physical and cellular systems of the body and uses specialized forms of energy to positively affect those energetic systems that may be out of balance. The Quantum Pendant works by radiating natural scalar energy, which enters the body of the wearer and is distributed to the areas in need of energy balance. It helps to restore energy that has become weak in the body. By restoring the energy balance in the body this pendant helps one to maintain health and well-being. Nicola Tesla demonstrated the existence of Scalar Energy towards the end of the 19th century. It is a subtle energy that can be harnessed to produce healing energy. Science only recently have positively demonstrated it's existence and are harnessing it for health purposes. Wear it on a chain or carry it in your pocket. 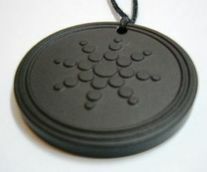 The scalar energy from the pendant works outwardly and within the body. Outwardly scalar energy enhances the body’s bio-field. Inwardly it works to facilitate cell permeability and thereby enhances the many physiological functions of the cells in the body. Scalar energy emitted from a scalar energy pendant turns dead water to living water by reducing its molecule size to smaller clusters thus increasing water's absorption or hydration capability many times. This facilitates the absorption of nutrients and detoxification at the cellular level. The German researcher, Andrija Puharich found that scalar energy enhance the functioning of the immune system. Lymphocytes (white blood cells) exposed to scalar energy increased proliferation (multiplied) by 75% compared to lymphocytes not exposed to scalar energy. Scalar energy has the ability to bring balance to the endocrine system and the rest of the body by bringing the energy level of the cells to the optimum -70 millivolts. Remember, EMF pollution and other negative factors can reduce cellular energy below this optimal level, leaving the body vulnerable to disease. Is leaky gut the hidden root of your health challenge? More and more is being discovered today regarding the clear connection between gut health and the overall health of the body. The fact is that food cannot be converted to energy or provide fuel to run the various processes of the body if it is not sufficiently digested and absorbed. Nor can the body be truly healthy apart from adequate nutrition. In actuality, a great many more health issues people commonly experience originate with poor digestive health and a weakened immune system stemming from leaky gut syndrome. However, the connection between the two is often not recognized since leaky gut syndrome symptoms run the gamut and conventional medicine tends to focus more on treating symptoms than identifying underlying root causes. In order to comprehend how a condition such as leaky gut can cause such a wide array of health problems, one must first understand the important role the gut wall plays in protecting our health. The lining of the small intestine forms a barrier that keeps unwanted compounds in the digestive tract from escaping into the bloodstream where they can travel throughout the body. This semi-permeable barrier acts as our first line of immune defense – sorting through and selectively choosing what raw materials the body can assimilate while, at the same time, rejecting any microbes, toxins, large food molecules or whatever else might adversely affect the health of the body. Nutrients the body needs to produce energy and fuel its processes are absorbed into the bloodstream through hundreds of villi (small, fingerlike folds) that line the walls of the small intestine, each of which is covered with thousands of microvilli. Because villi and microvilli appear under a microscope similar to bristles on a brush, this one-layer thick small intestine lining is sometimes referred to as the “brush border”. If the surface area of all of these villi and microvilli were spread out flat, it would comprise an area the size of a tennis court when you take into account that the small intestine itself is 20 to 25 feet in length. Even more amazing is the fact that the cells that make up this lining are able to replace themselves approximately every six days. Many people are unaware that approximately two-thirds of immune system activity takes place within this intestinal lining. One type of antibody produced there in abundance (secretary IgA) performs the job of neutralizing or otherwise countering bacteria, microbes, parasites and allergens to keep them from crossing the gut wall and getting into the bloodstream. Other specialized immune cells located throughout the gastrointestinal tract are housed in a type of lymphatic tissue known as GALT (Gut Associated Lymphoid Tissue) that lies just on the other side of the brush border. The job of these immune cells is to identify harmful substances and alert white blood cells and macrophages (another kind of immune “attack” cell) to destroy potentially harmful substances before they can enter the bloodstream. In this way, the small intestine lining functions as both a barrier and a gatekeeper. How well the immune system is able to do its job of counteracting harmful substances in order to keep them from penetrating the internal environment of our body greatly depends on the condition of the intestinal brush border. In a perfect world food particles are reduced to their lowest common denominators before reaching the wall of the small intestine for absorption - proteins into amino acids, carbohydrates into simple sugars and fats into fatty acids. A healthy gastrointestinal tract only absorbs these types of completely digested food molecules. Leaky gut syndrome (termed “increased intestinal permeability” in the medical world), is a condition that develops when gaps form in the tightly packed junctures between cells in this protective membrane due to inflammatory damage. Tiny holes or tears from various sources of irritation cause these gaps to widen, allowing partially digested food components as well as bacteria, yeasts, parasites and toxins to literally leak into the bloodstream. A leaky gut is usually characterized by damaged cells in the intestinal lining along with flattened or inflamed microvilli that are no longer able to effectively secrete IgA or produce the special enzymes needed to facilitate the absorption of nutrients in the final stage of digestion that takes place in the small intestine. A leaky gut wall becomes like a sieve that lets food particles pass into the bloodstream before they are completely digested. Because partially digested food and other substances were never meant to enter the bloodstream, the immune system perceives them as foreign invaders and acts to mobilize an immune defense against them. Antibodies form and white blood cells spring into action to initiate the inflammatory process the body engages to deal with these “invaders”. Oxidants and free radicals are produced in this battle that can cause further irritation and inflammation to other parts of the body. Since the inflammatory process makes tissues swell, cell membranes can lose tone and more easily become porous over time. As the intestinal lining becomes more permeable, its ability to act as a protective barrier is compromised. When the gut loses its ability to filter incompletely digested food particles, harmful toxins and microbes, the organs that must deal with the effects of that influx in the bloodstream and lymphatic system can become overburdened with the toxic load. The liver, which acts as a back-up “second line of defense” for the body, especially bears the brunt of dealing with these substances. This is because everything from the digestive tract first goes to the liver for processing before it can be utilized by the rest of the body. The more the liver is bombarded with inflammatory irritants and partially digested food molecules, the less capacity it has to break down or neutralize chemicals and metabolic byproducts. Gastrointestinal Problems – abdominal pain, gas and bloating, diarrhea, constipation, irritable bowel syndrome, inflammatory bowel disease, Crohn’s disease, Celiac, Candida, and SIBO (small intestine bacterial overgrowth) are typical gastrointestinal conditions that arise from a “leaky” gut. Poor Digestion – although poor digestion is often a causal factor of leaky gut syndrome, a damaged gut can also lead to further digestive difficulties due to reduced enzyme production within the villi of the brush border of the enzymes needed to break down certain types of sugars (disaccharides). Nutritional Deficiencies - carrier proteins responsible for transporting minerals and other nutrients across the gut wall become damaged when prolonged irritation and inflammation occurs in the intestinal lining. The more villi and microvilli are damaged, the less surface area is available for nutrient absorption. Food Allergies – when incompletely digested food molecules escape into the bloodstream past a weakened and compromised gut lining, an immune system attack is triggered each time the offending food is consumed, which results in further inflammation and damage. For more information on these types of delayed food allergies, I would refer you to my article "Food Allergies - Could They Be Your Problem?" Weakened Immune System – leaky gut syndrome severely compromises immunity as the constant need to react to food allergens and other antigens can overwork the immune system and render it less able to produce the antibodies and hormones it needs to function effectively. Constant activation of the immune system defenses of the gut become a trigger for chronic inflammation. When the cells that produce secretory IgA are damaged due to inflammation, it becomes more difficult for the body to ward off bacteria, yeast, viruses and other harmful microorganisms. Translocation of Microorganisms – bacteria, yeast, fungi and other microorganisms can pass from the intestinal tract into the bloodstream where they can proliferate and infect other organs and systems of the body. An example would be the overgrowth of Candida, a yeast/fungal organism that emits toxins that can result in all types of symptoms, ranging from gastrointestinal distress to depression and brain fog. Autoimmune Diseases – food allergens and other antigens that enter the bloodstream and trigger the production of immune system antibodies often have a similar protein structure to the body’s own cells. When the immune system cannot distinguish “self” from “non-self”, a person’s own tissues may be attacked in the course of an immune response. At that point, diseases such as rheumatoid arthritis, multiple sclerosis, lupus, chronic fatigue, fibromyalgia, type 1 diabetes or any other of the 80 plus recognized autoimmune diseases may eventually develop. Brain and Nervous System Diseases – leaky gut syndrome increases the likelihood that neurotoxic substances become systemic and reach the brain. These substances are closely linked with mental and nervous system disorders such as brain fog, depression, anxiety, ADD and schizophrenia. Skin Conditions – because the skin is the largest organ of elimination, an overload of systemic toxins from leaky gut may manifest as eczema, psoriasis, cystic acne and other skin eruptions. Respiratory Conditions – since the same type of immune cells found in the gut also exist in the mucosal lining of the respiratory tract, the systemic effects of leaky gut may result in inflammatory conditions such as respiratory allergies and asthma. Do You Relate to any of These Symptoms? Antibiotics - antibiotics kill off the natural intestinal flora that normally protect the intestinal lining from the overgrowth of harmful microorganisms, leaving the intestinal terrain vulnerable to bacteria, parasites, viruses and fungi that colonize the area and contribute to gut-damaging irritation and inflammation. NSAIDS – Nonsteriodal Anti-Inflammatory Drugs (aspirin, ibuprofen, etc.) work by blocking pain and inflammation-producing prostaglandins (messenger molecules that circulate throughout the body). But they also cause damage to the protective lining of the stomach and intestines by blocking the prostaglandins that enable the body to repair them. Prolonged use of these drugs renders the gut wall weak, inflamed and more prone to intestinal impermeability. Antacids – decrease the acidity of the stomach and reduce the activity of pepsin (protein-digesting enzyme), thereby diminishing the ability of the stomach to adequately digest proteins. This increases the number of large, incompletely digested protein molecules that enter the intestines and, potentially, into systemic circulation. Refined carbohydrates - refined sugar and flour products are the worst but other grains, starches and sweeteners also can become food for harmful bacteria in the small intestine, enhancing yeast overgrowth and making it difficult for brush border cells to repair or function properly. This is especially true when friendly bacteria are absent and immune function is compromised. Hydrogenated fats - produce gut damaging free radicals when heated to high temperature. Processed foods - chemical additives, preservatives, and artificial coloring and flavoring in processed foods add greatly to the toxic load of the body and are a source of irritation to the intestinal lining. Even more of a problem is the fact that processed foods are deplete in nutrients. Not only do they only lack the nutrients needed to process them but they additionally drain the body of valuable nutrients it needs for other purposes. Artificial sweeteners and sugar alcohols – produce short-chain fatty acids that promote inflammation in the lining of the gut. Alcohol & Caffeine – irritate the gut wall and decrease the number of friendly bacteria needed for a healthy gut (ethanol in alcohol has a particularly damaging effect on lining of the small intestine). Anti-nutrients in foods – anti-nutrients such as lectins and phytates prevent or disrupt proper digestion and absorption of nutrients when foods containing them are consumed. Lectins are proteins found primarily in grains and legumes that attach to antigens of certain blood types and cause cells to stick together. This reduces their self-repair ability and can create damage to intestinal villi. Phytates that are found in the hulls of grains, legumes, nuts and seeds, make the food more difficult to digest since they bind with minerals within those foods and prevent their absorption (minerals are needed for the functioning of enzymes needed to break down food). Soaking and/or sprouting these types of grains, legumes, beans, seeds and nuts greatly offset the effects of the enzyme inhibitors within them. Food allergens – Food allergies and leaky gut go hand in hand. Even though food allergies often develop due to a leaky gut, continuing to eat reactive foods only increases inflammation and worsen the condition of the gut wall over time. Protein fragments such as gliadin (protein in wheat gluten), zonulin (protein activated by gliadin known to widen gaps between cells and increase permeability), and casein (protein in milk) are among the worst offenders known to trigger immune system reactions. Because diets high in grain and dairy are so typical in this country, people tend to eat more of them than their body is able to handle, which is a primary reason food allergies and intolerances are a growing problem today. Imbalanced Intestinal Flora – Chronic bacterial or viral infections, parasites and yeast/fungal overgrowth such as Candida upset the balance of intestinal flora within the intestinal tract. As these microorganisms feed on undigested food molecules, they flourish and outnumber the population of friendly bacteria. Toxins emitted by these organisms contribute to the inflammatory damage leading to leaky gut. In the case of Candida, root-like structures literally penetrate and form holes in the intestinal lining. As I previously covered, antibiotics and other drugs upset the balance of intestinal flora by destroying beneficial bacteria. Poor Digestion and Overeating – Normal gastrointestinal function cannot occur without adequate digestion. Deficiencies in digestive enzymes, hydrochloric acid, and an imbalanced gastrointestinal pH can cause impaired digestion that contributes to malabsorption, food allergies, bacterial overgrowth and other factors tied in with the development of leaky gut syndrome. Since overeating burdens the digestive system with more food than it can process at one time, excess undigested food molecules can further contribute to poor intestinal health. Toxins & Chemicals – The cumulative toxic burden from daily exposure to household and environmental chemicals, heavy metals and other toxins overwhelms the immune system and depletes nutrients, removing resources needed for repair and replacement of intestinal cells. Trauma or Prolonged Stress – High levels of cortisol and other chemicals produced during periods of stress can contribute to intestinal inflammation. Stress robs the body of glutamine, the primary fuel for the cells that make up the intestinal lining. Since stress affects our immune system’s ability to respond and reduces blood flow to digestive organs, it slows down the healing process. Besides mental and emotional stress, surgery, injuries, high fever, infections, and overly rigorous exercise are additional stressors to the body. As long as the immune system, digestion and detoxification processes of the liver work well, the small intestine lining is able to repair and replace itself in a matter of days. However, healing can be difficult and take much longer if any of these systems are impaired and/or overtaxed for any length of time. Following the recommendations for healing leaky gut can improve symptoms in some people in a matter of weeks whereas others with more advanced cases may take six months or longer. A number of steps are involved in healing a “leaky” gut. The first is really a two-step process that is of utmost importance, though it can be the most challenging to implement. Detect Reactive Foods - follow an elimination diet and/or obtain a food allergy blood test that tests for IgG antibodies in order to determine possible food allergens. If your doctor will not order this type of testing for you, you can order the test online yourself and a full lab report with interpretation and recommendations will be sent to you. Eat a gut-healing diet - this step involves avoiding any foods to which you are allergic or intolerant as well as other foods known to irritate the intestinal wall. How long you must adhere to this diet in order for the gut to rest and heal depends upon the extent of the damage. During the time period, the body’s nutritional requirements should be met by consuming easy-to-digest proteins, fruits, non-starchy vegetables and olive oil while avoiding grains, milk products, legumes, starchy vegetables, high glycemic fruits, sugars, artificial sweeteners, alcoholic beverages and caffeine. Starches and complex sugars such as sucrose (found in most forms of sugar), maltose (found in grains) and lactose (found in milk products) are particularly problematic in that they require further breakdown by enzymes produced in the small intestine lining. When the gut wall is damaged and cannot sufficiently produce these enzymes, incompletely digested sugars and starches ferment and provide food for bacteria, Candida and other microbes that produce further damage. Fructose, a simple sugar found in fruit and honey, is absorbed without further action from these digestive enzymes and is better tolerated as a sweetener. People with more advanced cases of leaky gut syndrome that involve severe intestinal damage and inflammation may need to follow specialized diets such as the SCD (Specific Carbohydrate Diet), GAPS (Gut and Psychology Syndrome) or Paleo diet, which are designed to eliminate the kinds of foods that irritate the gut and otherwise contribute to poor intestinal health. Take measures to remove yeast, parasites and other harmful microbes - this includes eating a diet free of the sugars and starches (that quickly turn into sugar) that feed these microorganisms and using antifungal agents (such as pau d’arco, caprylic acid, oregano, garlic, or a blend of herbs) or antibacterial agents (such as garlic, goldenseal, una d’gato) or antiparasitic agents (such as black walnut, garlic, wormwood, artemisia) to reduce their population, depending on which microorganism is the problem. Take broad-spectrum plant-based enzymes – plant-based enzymes replace living enzymes destroyed in foods by cooking and other means and help with the breakdown of all types of food components. Combine foods properly - eat fruits alone and avoid mixing proteins with starchy carbohydrates. Minimize drinking liquids with meals (especially cold liquids) that dilute gastric secretions and prolong the digestive process. Avoid overeating and eating when stressed. Avoid the use of antacids and acid-blocking drugs - these drugs neutralize stomach acid needed to break down proteins, the primary food molecules that overactivate the immune system and leads to the development of food allergies and intolerances. For more information on improving digestive health, I would refer you to my articles "The Key to Good Digestion" , "Stomach Acid - Too Much or Too Little" and "The Key to Health and Longevity". Waste that is not rapidly eliminated can irritate and inflame the intestines as well as increase the likelihood that toxins reabsorb and circulate back to the liver, increasing systemic toxicity. The use of extra fiber helps reduce intestinal inflammation, binds toxins and irritating substances, and improves colon transit time by holding moisture in the intestines to remove them more quickly. In addition, fiber acts as food to help boost the growth of friendly flora in the intestinal tract*. Supporting the liver involves supplying key nutrients and herbs that protect it as well as fuel the detoxification process it uses to convert harmful fat-soluble toxins into water-soluble forms the body can easily excrete. Milk thistle, N-acetylcysteine (a precursor to glutathione production), lipoic acid, Vitamin C and other anti-oxidants are used for this purpose. To cleanse and stimulate overall liver function and bile production, herbs such as dandelion root, fringe tree, Oregon grape root and beet leaf are recommended. Consuming vegetables such as dark, leafy greens, beets, artichokes and young dandelion greens will further help to cleanse and support the liver. For more information on supporting the organs of the body involved in detoxification and elimination, I would refer you to my five-part series on "Detoxifying for Better Health", particularly Part 2 and Part 3 which covers colon cleansing and liver detoxification. * Special Note: those people with leaky gut who also have SIBO (Small Intestine Bacterial Overgrowth) may need to avoid certain types of fiber since it may accelerate the growth of harmful bacteria and worsen SIBO symptoms. Repopulating the intestine with friendly bacteria by eating fermented foods and/or taking a high quality multi-strain probiotic supplement is often necessary to restore the balance of gut flora needed to strengthen the immune system, protect against yeast and bacterial overgrowth, and help breakdown food as well as neutralize toxins. Nutrients: vitamins A, C, E, folic acid, zinc, selenium, magnesium, essential fatty acids GLA (gamma linoleic acid such as borage oil) and Omega-3, NAC (besides a detoxifier, this nutrient acts as an anti-oxidant to counteract free radicals that contribute to oxidative damage of the intestinal mucosa) and L-glutamine, the latter of which is the preferred fuel for intestinal cells and is the most highly recommended nutrient for healing the cells that line the small intestine (this supplement works most effectively when taken in-between meals on an empty stomach). Herbs: herbs aid repair by acting as anti-inflammatories, anti-oxidants as well as astringents, the latter of which work to tone and tighten the tissues and reduce gaps between cells in the brush border. Herbs commonly recommended in these categories are quercetin, kudzu, licorice (deglycyrrhizinated form known as DGL), turmeric, chamomile (can be taken in tea form), and una de gato. Herbs that work to cool and soothe damaged tissues and absorb irritating substances are aloe vera (juice is best vs. whole leaf), slippery elm, marshmallow root, calendula and plantain. Bone broth – is loaded with easily assimilated and vital nutrients, such as glutamine, collagen and glycine that help repair the gut and restore a healthy mucosal lining. Adding a little vinegar while cooking the broth for long periods of time helps extract minerals from the bones as well. Broth made from real bones is also rich in gelatin that acts as “spackle” to plaster holes in the gut. Recipes for making bone broth can easily be found online. If steps are not taken to heal a porous gut wall, health may decline due to two primary factors: nutritional deficiencies from a growing inability to adequately absorb them and an overworked immune system with limited ability to protect the body against infections and disease. Keep in mind that good health is dependent upon a well functioning immune system and the body cannot regenerate healthy new cells and tissues if it is nutrient-deficient. If you suspect you may have leaky gut syndrome but are unsure and wish to be tested, a test by Genova Diagnostics is available that directly measures gut leakiness in addition to nutrient absorption capacity. It is called the “Intestinal Permeability Assessment” and can be ordered by your doctor or online at Lab Testing Direct.com or through other sites for approximately $100. This assessment simply involves drinking a solution with two non-metabolized sugar molecules (lactulose and mannitol) and collecting urine samples at designated intervals over a six hour period, which are then sent to a lab for analysis. However, it is not necessary to be tested to begin to work on improving your digestive health. Many of the guidelines in this article can benefit anyone, whether they already have leaky gut syndrome or simply wish to prevent it by taking better care of their intestinal health in order to enhance the overall health of their body.